From an early age we all aspire to be something, whether that be an athlete or a famous movie star. For Henry Hill, his aspirations laid on being a gangster. Directed by Martin Scorsese, the 1990 crime film Goodfellas has persevered as a film classic due to its brutally realistic depiction of the glories and consequences of organized crime. The film was a success both commercially and critically, as it grossed over $45 million at the box office (on a $25 million budget), was well reviewed, and nominated for six Academy Awards. More importantly, it was deeply influential and altered the way crime dramas were made. The genre’s standard-bearer, The Godfather, was renowned for being philosophical and theatrical about the fall of principaled characters in pursuit of a noble (albeit misguided) end. By contrast, Goodfellas presents a less romanticized vision of the “mafia”, from the gritty point-of-view of the soldiers at street level. Based on the book Wiseguy by Nicholas Pileggi, this is the real life story of gangster Henry Hill (played by Ray Liotta), we’re brought straight into Hill’s shoes through narration. Being born of mixed ethnicity into a predominantly Italian-American neighborhood, Hill grows up to idolize the local mobsters who operated a cab stand across the street from his house, run by mobster Paulie Cicero (Paul Sorvino). Eventually Hill gets a job at the cabstand, becoming part of the organized crime scene, doing small bits of vandalism, and proving himself by keeping quiet when he is arrested. Soon Hill making more than enough money for a person of his age, stops going to school and instead spends all his time at the cab stand. 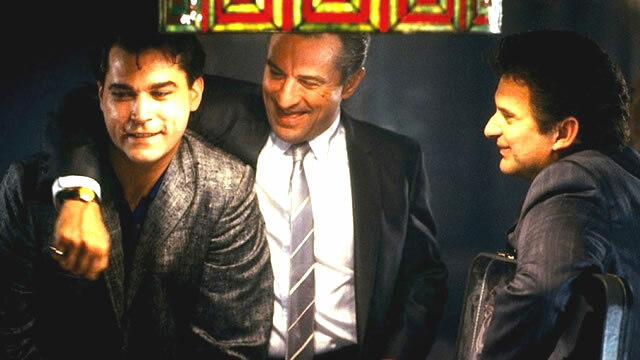 In his early years, Hill meets the other two gangsters who form the core triumvirate of the story, Jimmy Conway (played by Robert De Niro) and Tommy DeVito (played by Joe Pesci). The plot progresses further from here, taking the viewer through decades of what life looked liked in the mob throughout the 60s, 70s, and early 80s. Hill’s glamorous and luxurious life slowly deteriorates through these decades as he has marital problems, becomes drug addicted, is arrested, and eventually turns to become one of the biggest informants for the FBI. This movie does a lot right, starting with the choice of cast. Scorsese had worked with De Niro and Pesci a decade earlier with Raging Bull, but Liotta was a relative newcomer and played his role perfectly along with the superb cast. At the time, De Niro and Pesci were starring in a lot of comedies but their performance in Goodfellas reminded audiences how masterfully they can handle dramatic roles. 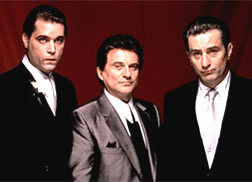 Many of the scenes were improvised, especially among these three actors, allowing a large amount of creative freedom on the actors’ side, and the narration by Ray Liotta is done extremely well in bringing us into Henry Hill’s perspective of what life was like as gangster and the scenes quickly fluctuate from being light and adventurous to downright shocking and brutal, all from the apparent point-of-view of Hill. Beyond these three and Sorvino, the supporting cast is also brilliantly led by Lorraine Bracco, who plays Hill’s wife Karen and is one of many bit players in this movie who would later star in the smash HBO series The Sopranos. Also notably great is the cinematography, as the scenes are wonderfully shot with such things as the camera angles and lighting matching the scene’s tones perfectly. The camera movement is graceful, allowing for certain scenes to feel as though we, the audience, are experiencing a tour of real life mobster hangout spots and does a great job bringing the viewer into the film. There is also a tremendous musical score to Goodfellas that powerfully paints the mood and era for each scene as the story goes along, and seemed to be completely original in the way it was used at the time. 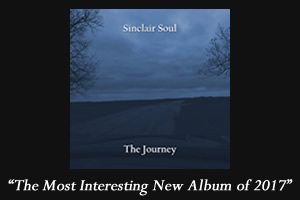 This music ranges from traditional crooners like Tony Bennett and Bobby Vinton to contemporary rock like the Rolling Stones, Cream, and George Harrison. Perhaps the most potent scene on this front is an eerie montage of dead bodies being discovered as the piano coda of “Layla” by Derek and the Dominos prominently plays. I have read reviews that give the impression that this movie glorifies organized crime . I’d say the violence shown in this movie, is a perfect example of how brutal organized crime really was (and is). The constant threat that, if you said the wrong thing to the wrong person, or did the wrong thing, you’d be killed without a second thought. Throughout the movie, we see again and again that through anger or paranoia, or even both, those involved in this field are brutally killed off. Overall, I’d say that this is one of (if not the greatest) films depicting organized crime. It takes nothing away from the Godfather but just takes the drama and looks at it from a different angle. At the time of its release, it was new and fresh, it differed from The Godfather replicates, that focused so much on the “family”, rather focusing on the true and brutal nature of organized crime, through the eyes of an actual gangster. 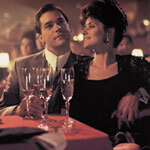 Since it’s release, Goodfellas has no doubt had great influence on subsequent crime dramas like The Usual Suspects and Reservoir Dogs, along with Scorsese’s own Casino and The Departed. Further, I contend that its chronological narrative and musical score has since been replicated in popular mainstream films like Forest Gump, making Goodfellas a true classic.